The final day of the 2014 AGU Fall Meeting has arrived! Yes, I am thoroughly exhausted, but no, it is not time to slow down just yet! Today is the most important day for my undergraduate researcher, Penn State Brandywine student Kimmie Bowen. We started the day by putting up her poster in the Poster Hall at booth #3464. We reviewed some of the highlights of her poster to make sure she would be ready for her official presentation time, which was not until the afternoon. We headed over to the morning session on citizen science, Era of Citizen Science: Intersection of Outreach, Crowd-Sourced Data, and Scientific Research, where eight speakers shared their projects, motives, successes and challenges. Many of the projects shared were based on astronomy and NASA missions. It was interesting to hear how citizen science supports NASA’s mission of public engagement and education (see NASA Citizen Science), and they even have a website to promote their programs such as Sun-Earth Day and the 2017 Great American Eclipse. Other interesting talks on citizen science highlighted a journey to Antarctica (The Spirit of Mawson Expedition), light pollution (Globe at Night), and air pollution. After lunch, we moved in to the Poster Hall, where Kimmie’s poster session officially began at 1:40PM and lasted until 6:00PM (yes, that is a very long time to stand in one place and talk about your research nonstop!). 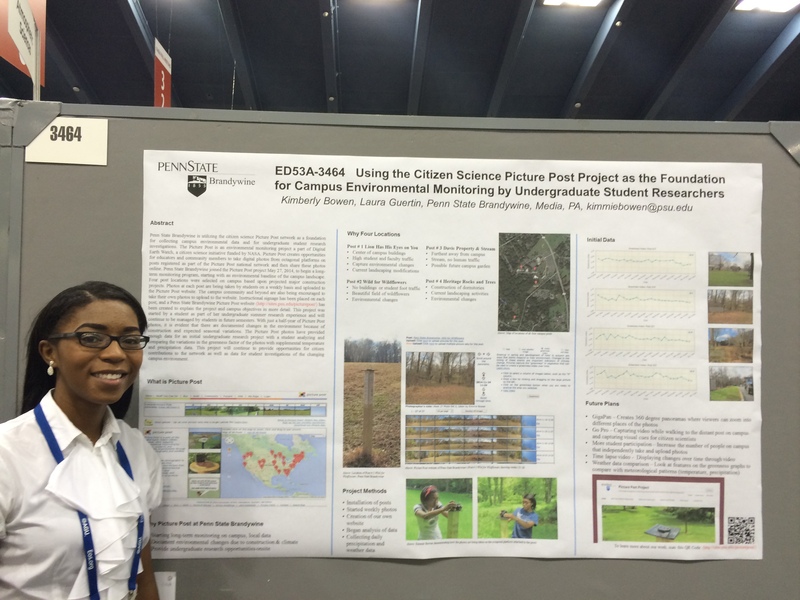 There were 14 posters in her session, and you can access her poster here on Penn State’s ScholarSphere. I watched Kimmie from a distance, making sure she was OK guiding meeting attendees through her poster and answering any questions she had. I have to say (and I’m not just saying this because she is my student researcher), Kimmie rocked! I was so pleased to see her confidence and how she explained her work and its relevance with such clarity. She was visited by three judges to be interviewed for the Outstanding Student Paper Award (OSPA). We won’t hear back for a couple of months if she won an award for her presentation, so let’s all keep our fingers crossed! 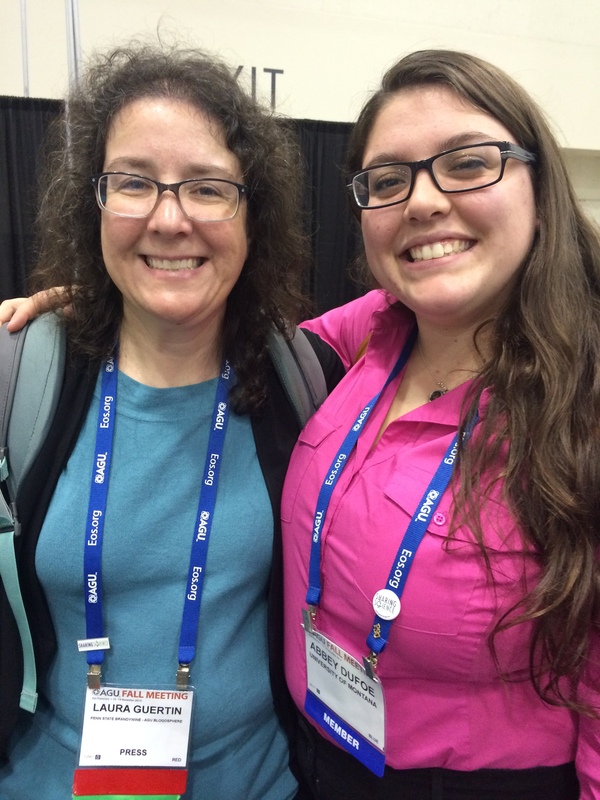 I certainly can’t take credit for all of Kimmie’s success at AGU. I’ll take credit as her faculty mentor, but Kimmie was fortunate enough to have a student mentor guide her through all things that are overwhelming about a conference with 25,000 attendees, with sessions in three difference convention center buildings and one hotel! Abbey Dufoe, a former Penn State Brandywine student, presented research she did with me at AGU when she was an undergraduate. Now in graduate school for environmental journalism at University of Montana, these two became fast friends and supporters of each other. AGU does not have a peer network set up for students, but clearly, these two figured out how to create one for themselves! 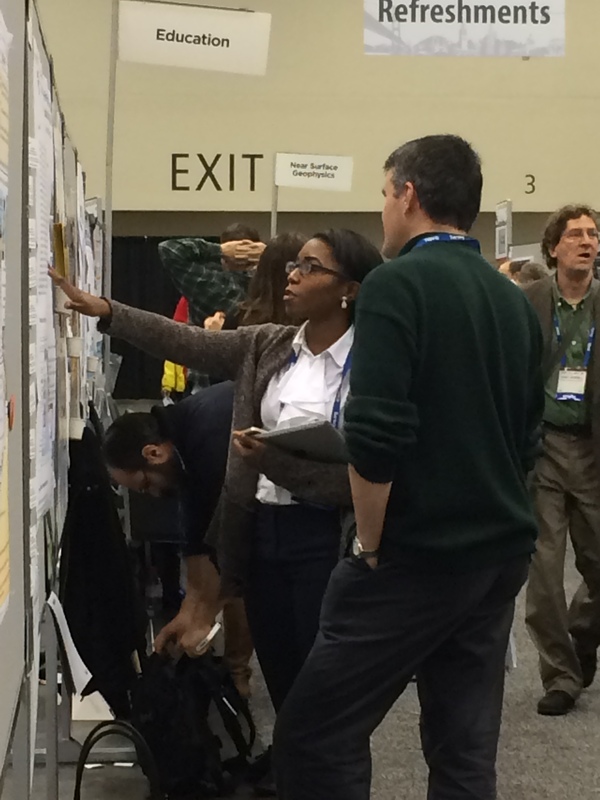 @earth_wise Fall AGU meetings are always a great time… saturated with science. Will continue processing it for quite a while.